We did it!!! We moved! We own our lovely brand new home!! No internet at the new place yet but can't wait to share pics with you. Of course it's full of boxes right now but I took a bunch of pictures of it empty... the "befores"! Was the second thing we did when we got the keys, right after a nice sage-burning cleansing we did in every room. Was husband's idea to borrow the traditional "smudging" ritual but it was a great way to center us and make the space feel like ours! congratulations to you and your husband. I know you will make it your own. Congratulations! I'm so happy for the both of you! I love that you smudged! :) Congratulations!!! :) Can't wait to see it! Congrats! Can't wait to see your "after" photos -I know you'll do something fabulous! Congratulations! That must be such a good feeling to be into the new house! Can't wait to see pictures - super excited for you guys! Congratulations!!!!!!!!! !%) This is big deal! So exciting! I can't wait to see the transformation as you make it into your own! Congratulations! I can´t wait to see some pictures from your house. I hope you will share many beautiful moments in there. Congratulations! 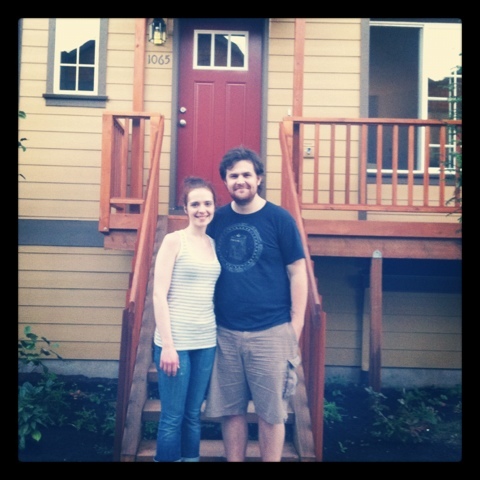 I was *so* happy to make the transition from renting to home ownership! I can't wait to see how you decorate it! Have followed all your posts since you chose the plot for your new home. Your excitement on the building's progress has been quite infectious. All the berry vest to you both - I hope that man of yours carried you over the threshold !! Very cool that you've been following along! I'm so glad it's finally done! Please show us posts of how you decorate. Can't wait till it's done and I can share! May you live through many wonderful memories in your new home! Congratulations! Can't wait to see pictures. This is so exciting for you! Hooray!!! Share chaotic, box-filled shots with us??? Congrats, looking forward to photos and sharing your excitement. THANKS!!! We are so excited and I can't wait to share before/after photos!!! You'll see some in-progress ones very soon!